Pickled apples: try the taste renowned poet adored! This simple, yet delicious treat was adored by the great Russian writer. Unlike most of his fellow 19th-century aristocrats, poet Alexander Pushkin was not picky about his diet. He preferred simple traditional Russian food and adored the dishes cooked by his nanny, Arina Rodionovna, who was an important figure for both his life and work. In one poem, Pushkin addressed Arina as “Dear doting sweetheart of my childhood, // Companion of my austere fate!” (as translated by Avril Pyman). Arina Rodionovna, who was a serf of the Pushkin family, cultivated the love for folk culture and folklore in the soul of the poet. Pickling apples allows the fruit to retain all its nutritious properties while adding a pungent flavor and piquant scent. With an enormous amount of vitamin C, pickled apples are a natural way to fight off infection. They are also full of calcium – good for strengthening bones, nails and teeth. Apples used for pickling should be rather hard and as flawless as possible. Any late or winter variety can be used, but the overwhelming favorite in Russia is the antonovka. Pickled apples should be made in a large ceramic or glass pot. Wash the blackcurrant leaves and place a thin layer of them at the bottom of your pot. Don’t use many, as there is a risk that the apples may become too sour. Place two layers of washed apples packed tightly over the blackcurrant leaves. Wash the cherry leaves, place a thin layer over the apples. Once again: place two layers of washed apples over the cherry leaves. Wash the mint leaves, place over the apples. Place the two final layers of apples over the mint. And the last layer: mix together all the remaining leaves and place them over the apples. 2. Make the press: cover your future pickled apples with a clean cloth, then place something flat on the cloth (it can be any top or cutting board, but its diameter should be less than that of the vessel, leaving the gap between its edging and the top). Traditionally, special wooden boards were used for this purpose. Place something heavy on top. 3. Prepare the pickling juice: boil the water, cool it down (it should be warm), then add salt, honey and malt. Stir the ingredients. 4. Let the mixture cool down then stir it once again. 5. Pour it into the vessel without removing the press. Put the vessel into a cool place (15-18° C). Don’t worry if the fluid level goes down: it’s completely normal. The most important point is that you should not remove the press until the very of the preparation process, otherwise the apples will quickly go bad. The first phase, fermentation, lasts 6-7 days. 6. After the fermentation phase, move the vessel to a cold place for the curing process (like a cellar or refrigerator, around 4-7° C) . 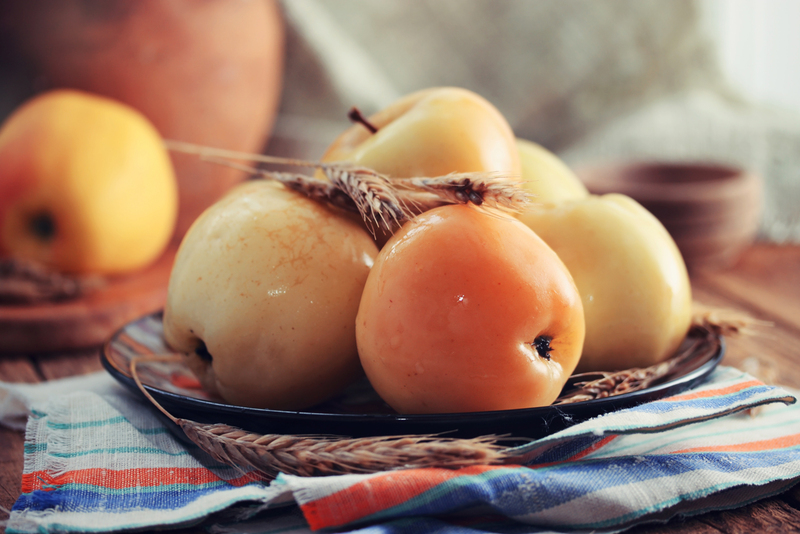 Usually it takes about 4-6 weeks for the pickled apples to be ready, but then you’ll have the chance to try the very taste Alexander Pushkin adored.